Looking for a way to commemorate a loved one or make your mark on history? Depending on your preferred location we can engrave your tribute in either brick or metal. 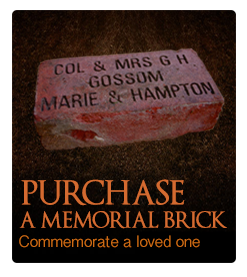 To commemorate at the Jackson Barracks location, click here for a Memorial Brick Order Form. To commemorate at the Camp Beauregard location, click here for a Memorial Wall of 1000 Plaque Order Form. This option provides you with several techniques to honor your service member. Contact Museum Director, Heather Englehart (504-278-8664; heather.s.englehart.mil@mail.mil) to find out more about the brick and plaque program. We thank you again for your support to the Louisiana National Guard Foundation. Contact Museum Director, Heather Englehart (504-278-8664; heather.s.englehart.mil@mail.mil) today to find out more about commemorative naming opportunities, the rare opportunity to commemorate the name of a veteran, loved one, family member for generations to come throughout the museum grounds. If St Claude Gate closed, proceed north around the block to N. Claiborne/W. Judge Perez Gate. After hours & weekend arrangements can be made by calling 504-278-8024. After hours & weekend arrangements can be made by calling 318-641-5733.